Any appreciation of comic books is largely subjective, so the full work of Jonathan Hickman is open to personal taste. Containing the longest arc ever in the history of the book – 35 issues lasting over two-and-a-half years – it was an undertaking that demanded reader attention and commitment. With comics becoming increasingly reliant on trade paperback collections to package their output, then it’s almost undeniable that such a long storyline works far better in collected form than being read on a monthly basis in small chunks. Before this point the longest sustained arc the title presented was an eleven-part epic in 1979/1980, with the team, sans Johnny, under the effects of a Skrull aging ray. Galactus and the Sphinx also had involvement, but here Hickman throws in almost every part of FF history – the Mole Man; Galactus; the High Evolutionary; a future Hulk descendant; Namor and Atlantis; the Inhumans; the Wizard; Immortus; Dr. Doom; Kristoff; Diablo; the Watcher; the Thinker; Annihilus; the Kree, the Celestials and more. As stated, the reader’s appreciation of such events is almost entirely subjective. One of Hickman’s first works after leaving the title was 2015’s Secret Wars, a revisit of the Battleworld concept from the 80s, also involving Dr. Doom, Beyonders, and more. Such conceits are either clever works that take established continuity and push them in new directions; or they’re the industry biting its own tail, coming up with nothing new, and instead only reworking story plots and concepts that others have come up with before. It’s important to note that, while Stan and Jack were not averse to repetition, they were creating new concepts and characters each year; it’s to Hickman’s detriment that while he may be attempting to do something new in these pages, his work follows a run of creators who have also played with the same characters. Indeed, a lot of Hickman’s run acknowledges recent continuity, building on such concepts as “Nu World”, which Mark Millar had installed. There are problems with such an approach, the main being that it doesn’t acknowledge the possibility that any issue could be someone’s first; that there’s no “jumping on” point for new readers, and the storyline only serves long-time fans of the series. 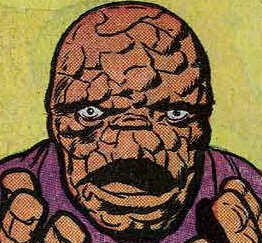 That it’s the Fantastic Four pitched to people who already read the Fantastic Four, and any hope of attracting new readers is now completely abandoned. Hickman also commendably attempts to flesh out the characters somewhat, giving us more “down time”, with birthday parties for the children and so forth. (On this note, then the last time Franklin’s age was directly referenced was in 2002, citing him as seven, so a birthday here must put him as at least eight... though the issue playfully avoids mentioning his exact age, Sue silencing Reed as he's about to. The letters pages of the 2013 issue #5AU directly states in answer to a reader's question that "Frankie is presently eight years old."). Not only are such plotlines unpalatable in a monthly schedule with the book costing $2.99 – again, events that can be more appreciated in trade paperback form - but in fleshing the characters out it forces longer-term readers to acknowledge that, with the best will in the world, the characters often weren’t all that well-rounded in the first place. Certainly, while vastly entertaining, the characters originally started somewhat as archetypes, and marrying together such disparate takes on the title is a hard task. As for the issues themselves, then the opener here contains a particularly obnoxious scene: Johnny’s ex-girlfriend kills Reed’s first love by breaking her casing (She’s now a brain in a jar) and digging her heels into the brain tissue. In turn she’s punched to death by a future descendant of the Hulk, “Banner Jr.”, who punches her in the face with graphic results. Ben and Johnny leave without any real emotional response to the scene, almost as if they think that this is how heroes are supposed to behave, or, worse, they’re too intimidated to confront the future Hulk after he’s just committed murder. Even though Johnny’s relationship with Psionics was just a fling, his lack of emotional involvement betrays what the character once was, many years since. Though as said issue is revealed to be a bedtime story that Sue is relating to Franklin, perhaps everyone has lost their moral compass in this era of the comic. 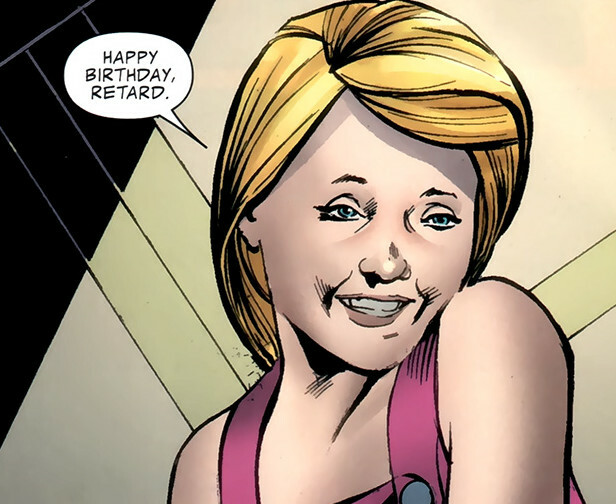 Even more controversial was Valeria teasing Franklin with the word “retard” in Issue #574. Although it sets up quite a clever plot device (she acknowledges that she recognises a much older Franklin from the future by saying the same to him), it was a highly questionable term that saw Hickman justify its inclusion in the book’s own letterpages. His ultimate justification – that, while mean, is the kind of things that kids do say to each other – is fundamentally sound, though it’s of course questionable whether such words should appear in the title at all. 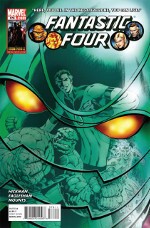 In terms of the characters themselves, then the two big developments are that Reed places Valeria and some other children (including advanced intelligence Moloids) into a “Future Foundation”; and that this Future Foundation is able to devise a cure for Ben, so that he can turn into human form for a week every year. This does produce a less appealing offshoot, in that Ben takes the opportunity to reconcile with Alicia. While Alicia Master is a fine character, their relationship in the book had ended for over 25 years, and such backwards-gazing plot developments would only please very long term readers. Sadly, Dale Eaglesham's art, while still technically quite fine, is often lifeless, with characters lacking spark in their eyes or motion in their movements. Eaglesham moved on after #578, but his replacement, Neil Edwards, produced even scrappier work. Even worse is the fact that "blog entries" are used to explain plot points that don't appear in the title, events that could be shown instead of having many dialogue-free visual scenes. Really, when you've got 35 issues to play with, and you're still having to miss out scenes and have a supplemental text explaining what's been going on, then it's a failure of craft. Following on from 2007's issues, where related, supplemental comics weren't even referenced, here we get Valeria releasing that Doctor Doom has brain damage... but how, why, when and where is never explained or referenced. It's up to readers to google such events, and find out that it relates to events in the story arc The Fall of the Hulks... details to follow.